Demon Or Serial Killer In First Trailer For EL GUARDIAN INVISIBLE? A collision of cold facts and local superstition lies at the heart of El Guardian Invisible, Fernando Gonzalez Molina's adaptation of the hit crime novel from Dolores Redondo, as belief in old Basque legends cloud the details of a potential serial killer case. When the naked body of a teenage girl is found on the banks of the River Baztán, it is quickly linked to a similar murder one month before. Soon, rumours are flying in the nearby village of Elizondo. Is this the work of a ritualistic killer or is it the basajaun, the ‘invisible guardian’ of Basque mythology? Inspector Amaia Salazar leads the investigation, taking her back to the heart of the Basque country where she was born, and where she hoped never to return. 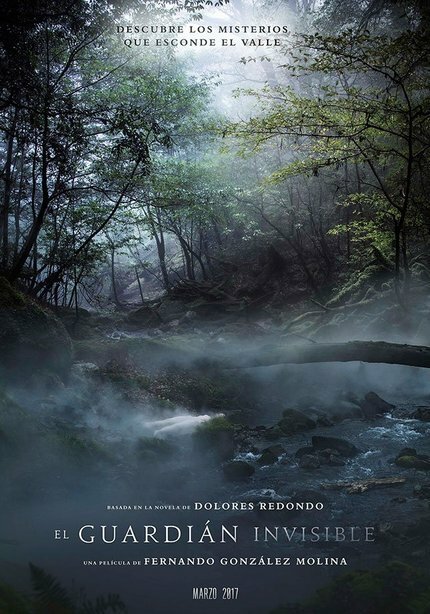 Shrouded in mist and surrounded by impenetrable forests, it is a place of unresolved conflicts and a terrible secret from Amaia’s childhood that will come back to haunt her. Sleep Tight and Cell 211's Marta Etura takes the lead in what looks to be a gorgeous crime thriller with an obvious Nordic Noir influence. Take a look at the first trailer below!